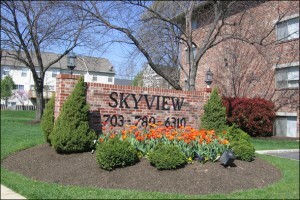 Skyview Apartments is a garden-style community developed by two architect brothers in the mid 1960’s and managed by the company that bears their name—Borges & Borges, Inc. Borges & Borges, Inc. designed, built and currently manages two other apartment complexes (one in Fairfax, VA and one in Forestville, MD). Throughout its history, the complex has enjoyed a very stable environment maintaining the original ownership structure and management company.Situated in a beautiful residential neighborhood off Richmond Highway in Alexandria, VA., the complex is five miles south of Alexandria city limits, minutes from Fort Belvoir, Fairfax County parkway, I-95 and the Capital Beltway (495). There is a direct bus route to Huntington Metro. We are within walking distance of Woodlawn Elementary School, shopping, restaurants, post office, county parks and South County Government Center. Mount Vernon Hospital and numerous doctor offices are located within a 3-mile radius.We have 10 buildings containing 119 spacious apartments ranging from 1 to 4 bedroom units with balconies/patios and walk-in closets. We provide a secure updated laundry facility in each building. Other amenities include; swimming pool, playground and picnic areas with grills. Please see our “Features” section for more information. We have recently upgraded our windows and balcony/patio doors achieving higher energy efficiency and creating a more comfortable living environment. We are constantly modernizing our units and take pride in the product we present to our prospective tenants. At Skyview Apartments, we strive to provide our tenants with a safe, comfortable and convenient living experience by promptly addressing all maintenance concerns with our on-site staff and providing 24-hour emergency service for water and heating issues. Our leasing office is open 8:00am to 5:00pm Monday through Friday (Saturday and Sunday by appointment only). Please come visit and we are sure you will agree that our location, features, floor plans and rent structure makes Skyview the best value in the area.